OPTIMIZED RIBCOR LOW KICK The ease and quickness of release of a lowkick with an enhanced flex zone in the upperthird of the shaft to allow players to storemaximum energy. OPTIMIZED VERTICAL FLEX Optimized vertical flex profile allows playerto move the puck into shooting position withgreater ease before exploding on the release. LOW KICK POINT Easy to load for a quickand surprising release. POPMATRIX TECHNOLOGYWITH RE-ENGINEERED TAPER The new geometry offers a smooth transitionarea to maximize bending and efficiently transferthe energy stored. LOW KICK POINT Easy to load for a quickand surprising release EASY TO LOAD TECHNOLOGY A unique layup that mirrorsthe RIBCOR shaft. SXX2 BLADE The blade’s stiffness goes from stiff in the heelto extra stiff in the toe for that quick release. 540 GRAMS MID KICK POINT The all in-one flex profile, greatloading for both wrist shots andslap shots due to its two differentstiffness zones. 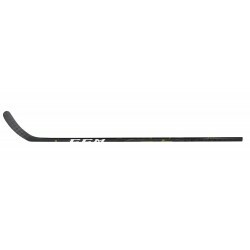 ATTACKFRAME BLADE A high stiffness for accurateshooting and passing. FULL GRIP Improved control and feel. HYBRID KICKPOINT The new kick point creates a hinge effect which allows for greaterpower while featuring a soft taper zone for increased speed. JETSTREAM BLADE CONSTRUCTION WITH DAMPENING LAYER TECHNOLOGY Featuring a multi-channel blade with a dampening layer on the entireface to achieve a unique blend of lightweight, feel and consistency. HYBRID KICKPOINT The new kick point creates a hinge effect which allows for greaterpower while featuring a soft taper zone for increased speed. JETSTREAM BLADE CCM’s patented multi-channel blade for precision and consistency. HYBRID KICKPOINT The new kick point creates a hinge effect which allows for greaterpower while featuring a soft taper zone for increased speed. 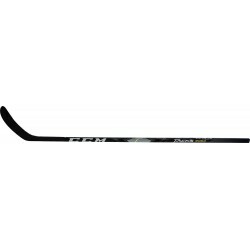 JS3 BLADE Designed to provide feel and consistency. T-GEOMETRY Our more traditional geometry featuring slightly squarer corners.